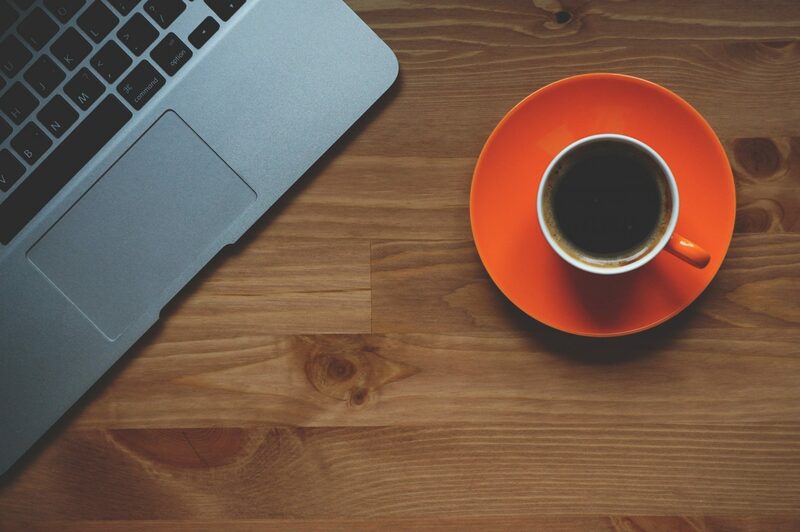 In this post we will be discussing the Protected Users group in Microsoft Active Directory. 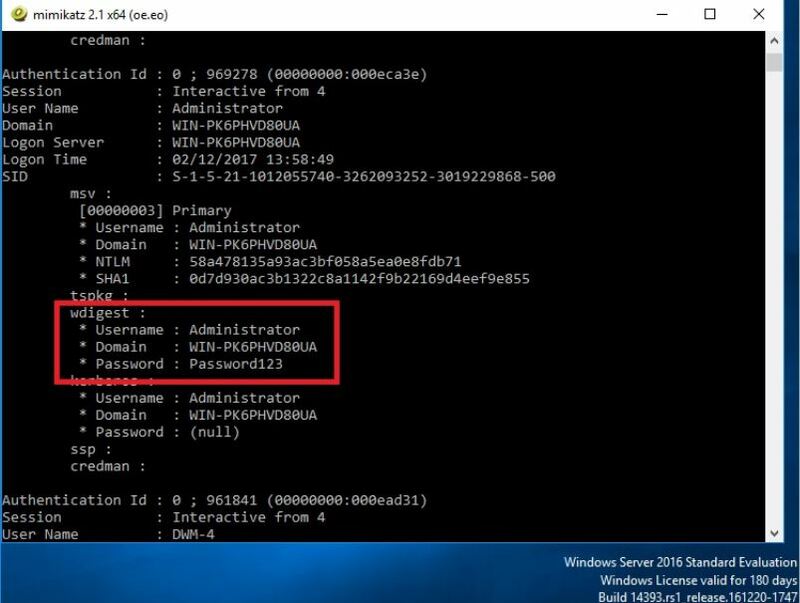 This is to try and raise awareness of this security feature built into Microsoft Windows Active Directory (AD) 2012 R2 Domain environments. The Protected Users group in AD gives its members additional security features and protection when logging into Windows Server 2012 R2, Windows 8.1 and above. If an account is made a member of the group. The user account can only authenticate using the Kerberos protocol. We will demystify this shortly with an example, however in brief it means that this user will not be able to authenticate with NTLM, WDigest Authentication, or CredSSP. Which means using one of these Security Support Providers (SSP) will fail. This is a win, as we know the NTLM hash is obtainable and is very crackable, Digest Auth stores credentials in clear text in memory, CredSSP also stores clear text credentials however is an interesting one as this may break applications that use it. However you might argue as you would probably only use this for high privilege accounts, (as Microsoft advises here) it might not be so much of an issue, and would probably be re-evaluated on a case by case basis after testing. In addition to the above, the account will not use DES or RC4 in the pre-authentication stages. The domain therefore must support AES. This will only take affect on Windows 8.1 and Windows Server 2012 R2, so no change for Windows 7 and Server 2008 I am afraid. So when logging into Windows 7 or Server 2008 variants your don’t get the protection from Protected Users membership. 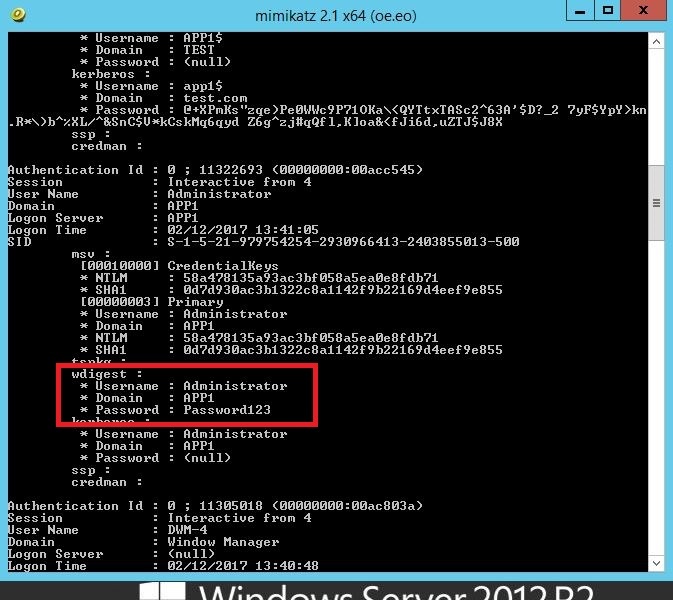 Windows Server 2012 R2 Domain Functional Level is required. Managed Service Accounts (MSAs) and group Managed Service Accounts (gMSAs) as well as computer objects can not be added to the group. (technically they can, however it will break things). What does all this mean then in actual protection terms, what does it look like? 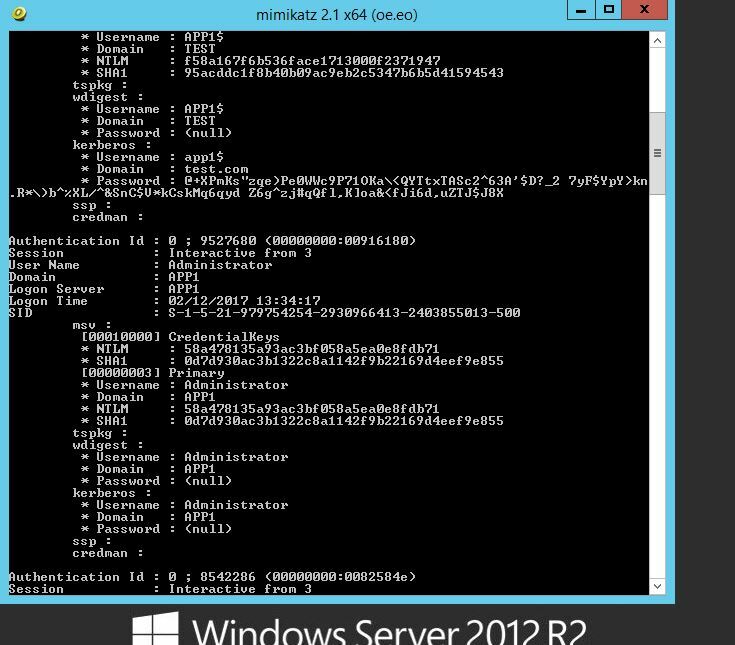 Lets test with Windows Server 2012 R2. 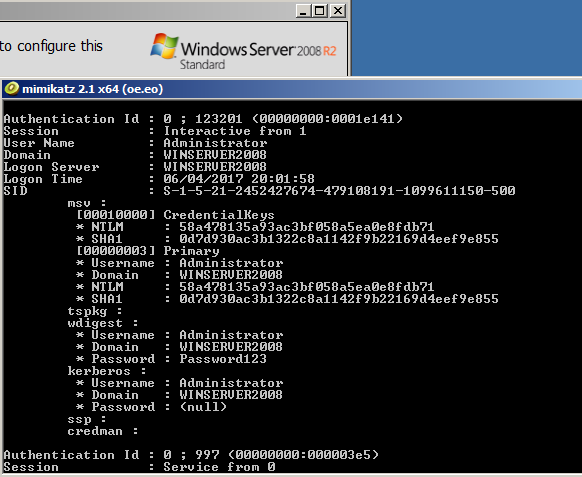 If we dump creds on a vanilla install with mimikatz this is typically what we would see. So no wdigest as this is disabled by default however what we can see and retrieve is the NTLM hash for the account ‘Adam2’, which as we know can be cracked off-line. No NTLM hash, this is because members of the protected users group will only authenticate with Kerberos and not with NTLM. Great. This seems like a win for high privilege accounts. More to come on this soon. 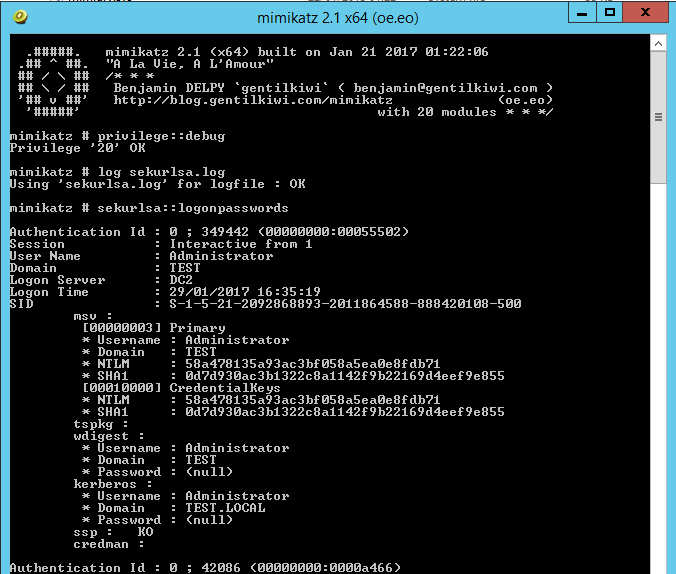 Stopping mimikatz from dumping clear text credentials. 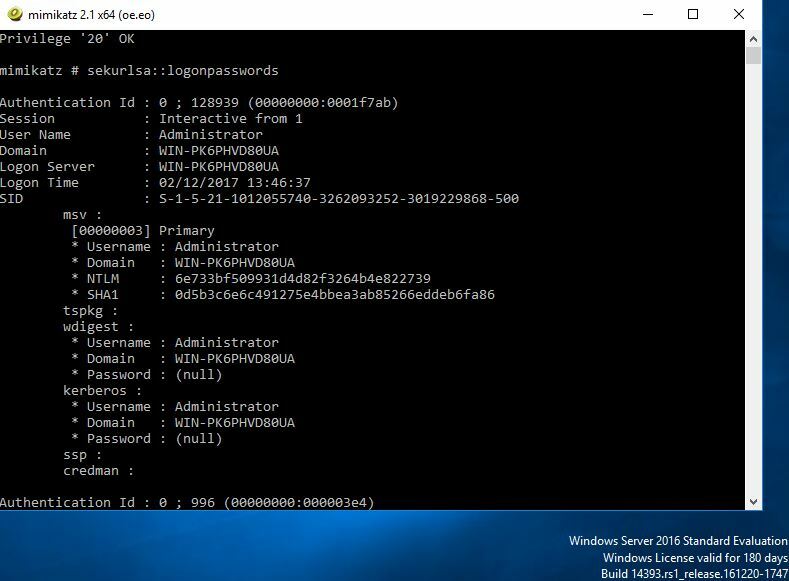 This post aims to demystify what can be done to restrict mimikatz from running successfully in Windows. Specifically how we can mitigate clear text credentials being dumped out of memory. My aim is to demonstrate what can be done to the operating system configuration to help reduce this from happening. In a follow up post perhaps we will look into how we might be able to identify if this has or is happening to a machine on the network. 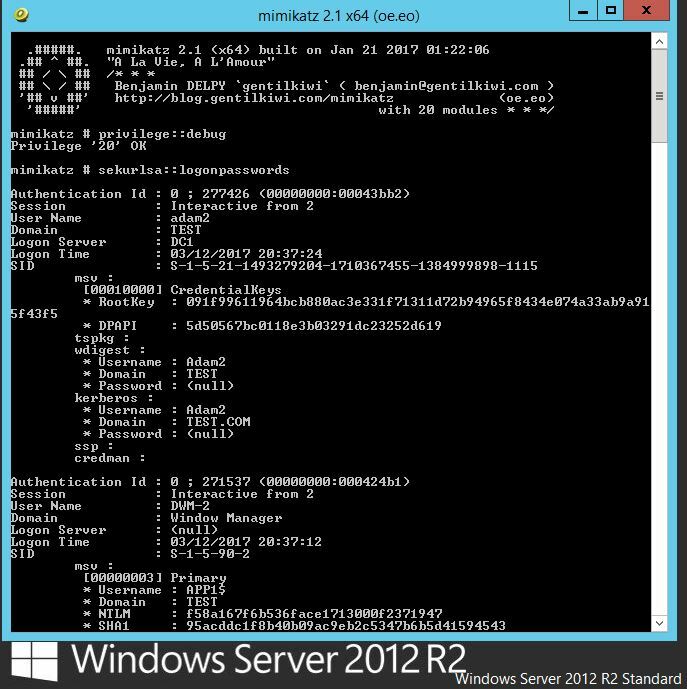 Once a user logs on to a windows system the credentials are stored in the Local Security Authority Subsystem Service (LSASS). Once creds are cached, from here, with various tools, not just mimikatz, credentials in the form of clear text and hashed passwords can be extracted. 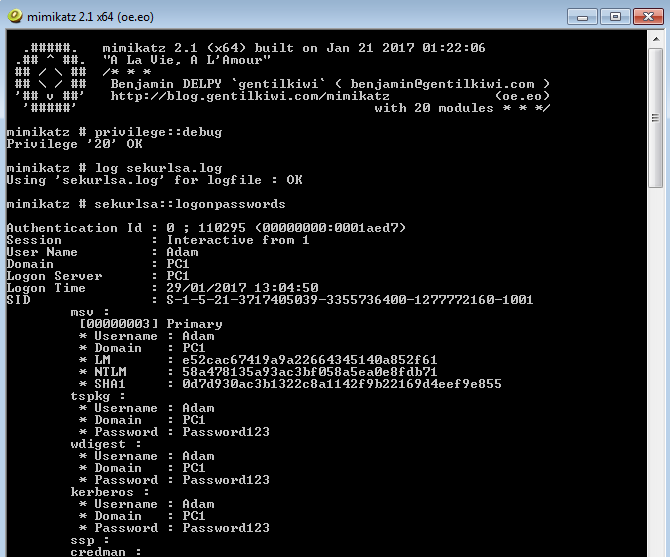 Mimikatz for a pen tester is a really great tool, like wise also unfortunately for hackers. 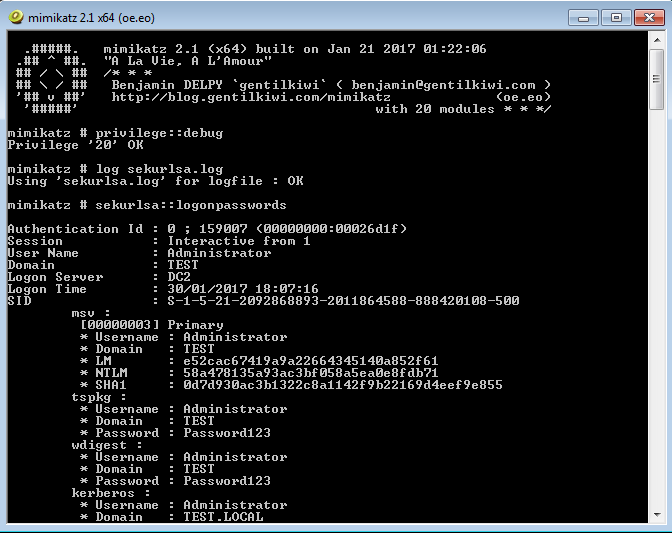 Created by Benjamin Delphy ‘gentilkiwi’ allows one to dump clear text credentials out of memory. It can do all sorts of other pretty cool things like perform pass-the-hash, pass-the-ticket or build Golden tickets, among others. Some of which I may walk through in the future. Here you can see the local account ‘Adam’ and the clear text password being displayed. This is clearly bad news for organizations, and an IT teams worst nightmare. 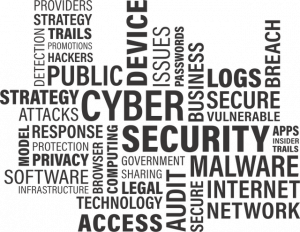 An adversary would have to initially compromise a workstation or server and gain admin or SYSTEM level privileges. This might be through a classic remote code execution vulnerability like MS08-069. Or through some other weakness in the software, or mis-configuration in the operating system. An attacker from here on would move laterally from system to system dumping creds. Ultimately with the aim of snagging a Domain Admin, or capturing that key piece of business data. This post isn’t necessarily concerned with showing you how to use mimikatz, rather it’s, to better inform IT teams how they can prevent clear text credentials being dumped. Any tester worth their weight will already know how to use it. I’m going to test by running mimikatz natively on a couple of Windows operating systems in my test environment, make changes to the system then re-run. 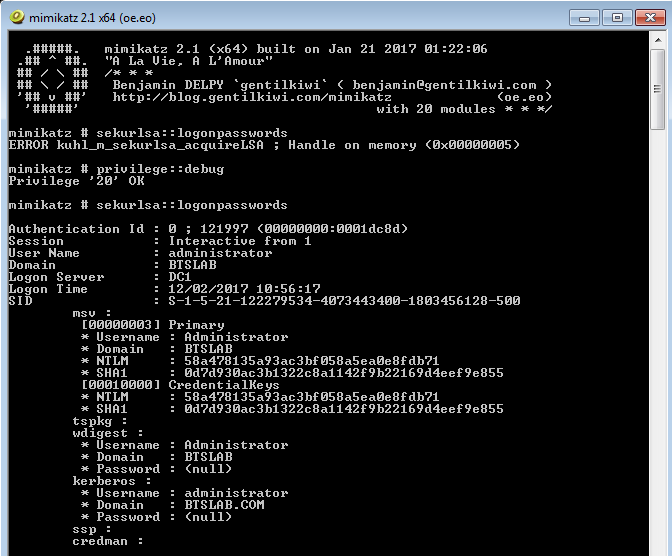 I’ll run through executing Mimikatz and the preventative measures we can use to stop the software interacting with LSASS and dumping creds. 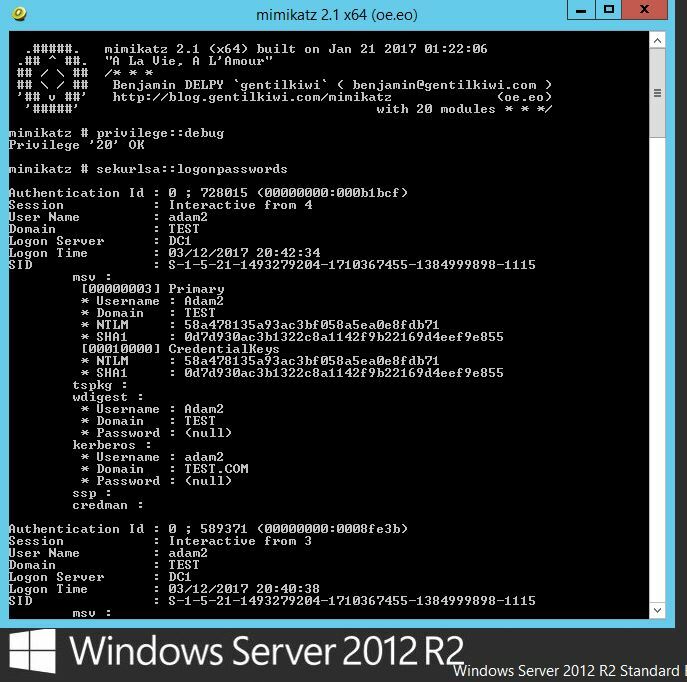 Lets start with Windows Server 2012 R2. Note where the ‘Password’ field is for wdigest and kerberos , this would normally reveal the clear text password however in this case a ‘(null)’ value is displayed. 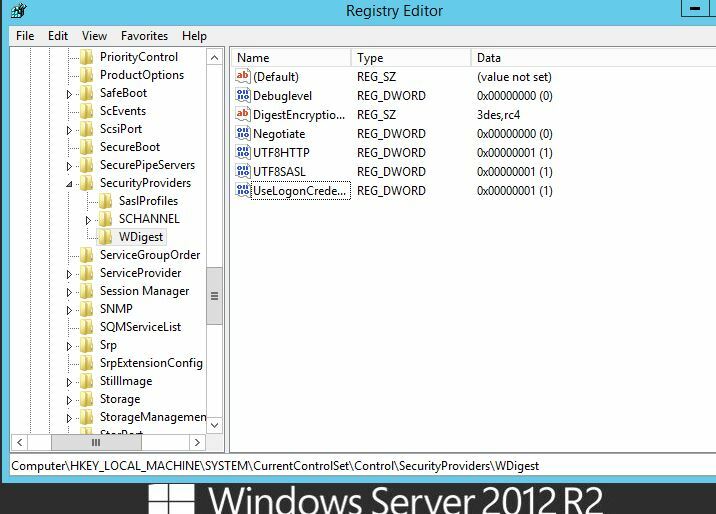 This is default behavior in Windows Server 2012 R2 and Windows 8.1 and above, sadly for older operating systems such as Windows 7 the credentials are in displayed here in clear text. The NTLM hashes are still present here which still isn’t great and so can potentially be used in ‘pass the hash’ type attacks (PTH on the rid 500 account) or cracked offline using large password lists. Lets see what we can do to harden our systems further. Thats more like it! Now we are getting somewhere. This is only going to slow attackers down. It is however also going to generate noise on the network when the attacker reboots the server. Lets reboot, and retry Mimikatz. As we can see the password fields no longer contain our clear text password, and have the (null) value instead. This is a significantly better position to be in, this still does however, reveal the NTLM hash which is still not ideal. 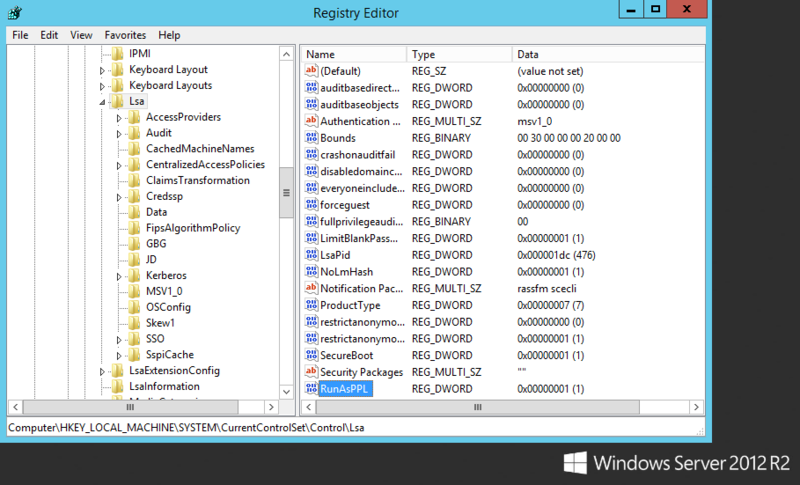 Unfortunately the RunAsPPL registry key, cannot be utilized in Windows 7. 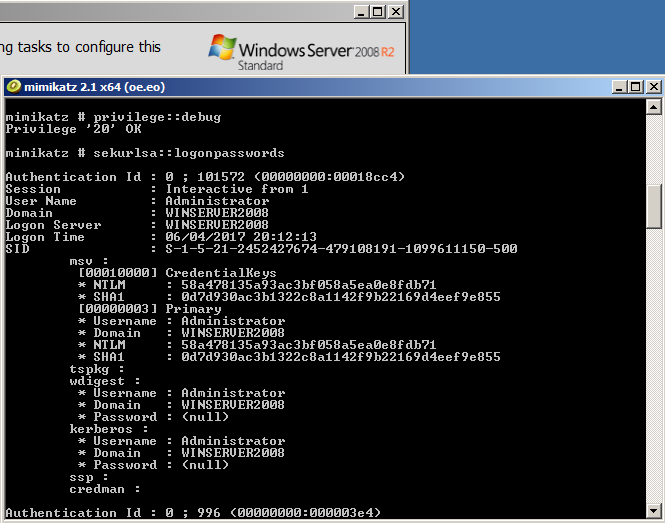 As we can see the local administrators account password for the wdigest field is in displayed in clear text. Now lets see if we can apply the same HKEY_LOCAL_MACHINE\System\CurrentControlSet\Control\SecurityProviders\WDigest\ UseLogonCredential registry key and at least mitigate the clear text password. First the registry key then a reboot. However… this wouldn’t stop an attacker from changing the reg key back logging off and waiting for credentials to be cached. 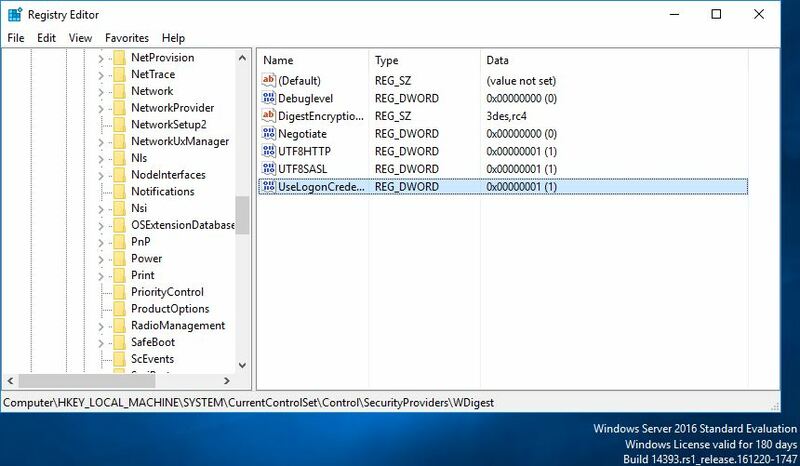 So far we have tested using mimikatz natively from the windows server 2012 R2 and successfully stopped mimikatz from executing the same should apply here for Windows 8.1 and above, however you should carry out your own due diligence and try this out to satisfy yourself. Windows 7 and Windows Server 2008 are slightly different and we can only go so far in stopping or slowing down this type of attack, to not displaying the clear text password only the hash. Unfortunately with different versions of Windows there are different fixes and varying degrees of success in reducing the impact of mimikatz being run on a system. As you will agree though this is significantly better than allowing the default configuration to remain. I hope this helps slow down your adversaries!